Crayons are, often times, children’s first physical expression of art, writing, and manifestation of the images and colors they see in the world around them. At Disney’s Hollywood Studios, however, it appears as if they don’t know which box to play with. Let’s start over in Andy’s Room, as found in Toy Story Midway Mania, where we venture under his bed and through his room. Alongside the board games of all our youths are a collection of miscellaneous View Master disc, random playing cards, and a well-crafted Lincoln Log structure. Also scattered among the remnants of childhood are crayons. 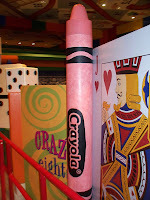 Andy’s mom has chosen the Cadillac of crayons for Andy, Crayola. And while the box cannot be seen, we can assume it was a bigger box of crayons since Andy has colors such as periwinkle and carnation pink that have been used and discarded to under the bed. Out on the streets, however, there are crayons of a different color. Block Party Bash, the Pixar infused afternoon parade of Disney’s Hollywood Studios, prefers a different crayon company that isn’t even available in any stores. Pixar crayons, still scattered about and not in a box, can be found among the parade’s floats. The best guess is that this is also a rather large collection of crayons as well, unless shades like Fool’s Gold Yellow and Gamma Quadrant Blue are standard issue in a pack of eight. No matter what crayons you are using, whether they are Pixar or Crayola, keep on coloring! Happy New Year to you and your lovely wife! May this be your best year yet. Our kids got Toy Story Mania for Wii, and while not the same as "being there" it does evoke some great memories (doesn't make my arm as tired, though)!